Legend has it that wild raspberries were discovered in the 1st century BC, on Turkish mountain slopes, but the delicious fruits were overlooked in favour of the roots and blossom which were used to make ointments and teas to relieve various ailments. Centuries on, we know they’re packed with vitamin C, minerals, antioxidants and fibre – but we no longer neglect the juicy berry! Shop-bought raspberries can be expensive as their soft, easily-bruised fruit makes them difficult to transport. All the more reason to hit the hedgerows and forage for your own! Picked on a dry day, raspberries will keep for a day or two in the fridge but, when frozen in a single layer then packed into a plastic bag or box, can be enjoyed months later. Lavish a little culinary love on your harvest and you can expect a taste revelation. A balance of sweet and sharp, their tart edge works just as well in savoury dishes as it does sweet… try them with parma ham and a dash of balsamic vinegar, or simmer with red wine, a little mustard, thyme and seasoning to make a glaze for baked ham or sauce for turkey. They can even be used in fruit wine and beer – simply delicious. Those with more traditional taste buds may consider them for sweet alone but, as much as we love a jam tart or Victoria sponge with seeded jam, there’s a world of imaginative ways to transform your freshly picked bounty. We’ve made a few suggestions below – why not give them a go? 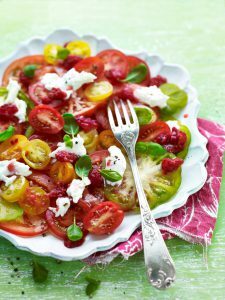 A taste of summer and sunshine made from tomatoes, fresh raspberries and mozzarella. Perfect for lazy summer afternoons or as a starter at your next dinner party. These delicate little nibbles are ideal for afternoon tea or well-deserved treat! 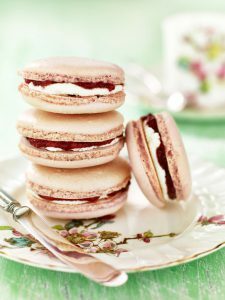 Made with egg whites, raspberry jam and mascarpone, they’re impossible to resist!